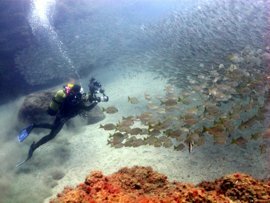 Following the devastating hurricanes that have destroyed much of the tourist infrastructure on the Islands of the Caribbean in summer 2017, several divers have asked us how diving in the Canary Islands compares with diving in popular Caribbean destinations such as the Bahamas, British Virgin Islands, and Turks and Caicos Islands. There are just seven main islands in the group ranging from El Hierro in the west to Lanzarote in the East. It was from these islands that Christopher Columbus set off to discover the New World. The islands are volcanic in origin, and have excellent, western infrastucture and connections. The Canaries are also an excellent place to dive all year round... not quite as warm or as vivid in colour as tropical destinations, but warmer and more prolific that the Mediterranean, with sharks, rays, turtles and wrecks and plenty of brightly coloured fish. 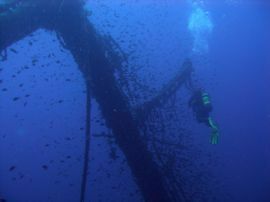 The main diving areas are open for diving all year round and there are over 70 PADI dive Centres across the Islands. The first surprise is that the Canaries and many Florida Resorts are both as far South!. Two popular diving destinations, Tampa in Florida and Arinaga in Gran Canaria both sit at Latitude 27.85º. Yet because of the geography surrounding both, the Canaries have a slightly cooler sub-tropical climate, while the Florida / Caribbean area have a warmer, Tropical climate. In summer the difference in water temperature is significant with temperatures up to 30ºC (86ºf) in the water in the Caribbean, while the Canaries reach a peak of about 24ºC (75ºf); In winter the difference is a bit more, with the Caribbean cooling to about 27ºC (80ºf) while the Canaries, warmed by the Gulf stream, drops to around 18ºC (54ºf) - but still warm enough to dive all year round in a wetsuit. Secondly, many people think that as the Canaries are 'in the Eastern Atlantic' that they suffer from the same sort of stormy weather, icebergs and cold water that could be used as a backdrop for a remake of 'Titanic'. The reality is that weather conditions are very stable in the Canaries, with high pressure from the 'Azores High' for much of the year and steady trade winds in summer. Just like the Caribbean, the Canaries can have odd stormy days, but if you look at our history of diving conditions in Arinaga you will see that we dive nearly every day of the year. The Canaries have always been renown for their sunshine, and even in winter there will be the chance to top up the tan on the non-diving days. Surface temperatures in the Caribbean can sizzle at over 45ºC in summer, while in the Canaries a temperature of around 35ºC is more common, with the trade winds cooling the air. Las Palmas, the capital of Gran Canaria is rated as having one of the world's best 'City' climates - not too hot in summer yet comfortably warm in winter. This difference is enough to restrict coral growth in the Canaries yet otherwise the diving conditions can be very similar, with good water clarity for most of the year in both areas. The Canary Islands have a range of colourful fish including parrotfish, wrasse, damselfish, glass-eyes and more, and if the Canary Islands lack the variety of the Caribbean, there are many species common to both areas, including lizardfish, goatfish, pufferfish, barracudas and moray eels which can be found in abundance here in the Canaries. More of interest to divers, is that the volcanic seabed has many dramatic rock formations that can be a major attraction to diving in the Canaries. The volcanic rock has been eroded in many of our dive sites to create caves, swim-throughs and spectacular underwater arches. 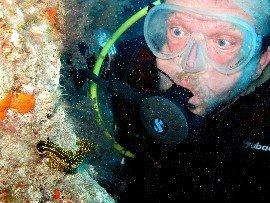 And if you like the dark it is easy to organise a night dive in the Canaries. There are also several endemic species that bring in divers from all over the world to photograph them. 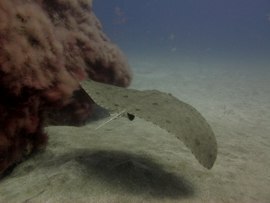 The Canaries are one of the best places to see and photograph angel sharks (squatina squatina) and you should look out for the barred hogfish, cabrilla pintada 'painted face' and the bright yellow and quite rare variant of the island grouper, known as abade capitan. If you are bringing your camera to take underwater photos then there are plenty of colourful subjects, such as cleaner shrimps, tiger morays, glasseyes, parrotfish, damselfish and wrasse. 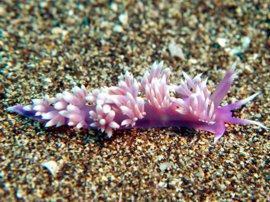 Browse through some of the photos in our gallery of photos from the El Cabrón Marine Reserve and you may be surprised by the variety and colours you find here. Puerto del Carmen in Lanzarote (the most northerly of the Islands) has several wrecks close to the harbour. When it comes to diver training, there is little to choose in terms of facilities and structure between the Canary Islands and the Caribbean. Both have long established, professional training schools, which are regulated by their governments to achieve high standards of safe training. 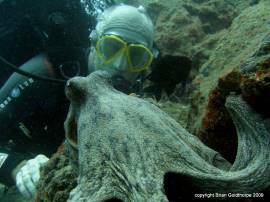 There are schools which cover PADI, BSAC, CMAS, ACUC and several other training brands throughout the Canaries. Particularly for those looking to fit in a course quickly, the ability to vary flight days can mean that you do not need to spend a full week away to get a qualification that is done in two or three days. Diving hot-spots such as the El Cabrón Marine Reserve make an excellent place to take courses such as the PADI Open Water Course because you get to see lots of interesting marine life such as cuttlefish, arrowhead crabs, octopus, trumpetfish, parrotfish, damselfish, wrasse and much more on all the training dives. We run courses all year round in the El Cabrón Marine Reserve so there are no restrictions on when you can do your course. The Canaries have an excellent infrastructure for residents and tourists, and are a modern, western country with a stable economy, good communications and government, and they have created an open and accessible tourist economy with a wide range of family and adventure options. There is a huge range of accommodation in the Canaries from simple apartments to five star luxury. The Spanish Canary Islands offers options such as theme parks, carnivals, concerts, unrestricted travel, car hire and diversity. If you want a good dive destination in the Northern Hemisphere then perhaps you should come and try the Canaries. The Canaries have much more variety of diving than the Mediterranean, as well as warmer seas. If you are looking for a short 'winter sun' break with a couple of days diving, or perhaps a family holiday where diving is just part of the mix, then the Canary Islands have many advantages. 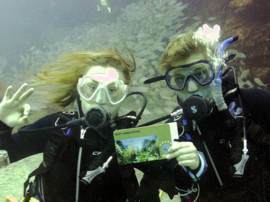 Plan your Canary Islands diving break now!